1 - Rolls to the right when triggered. 2 - Jumps to the left when triggered. 3 - Crouches when triggered. 4 - Climbs up 4 clicks when triggered (make sure he's 4 clicks below the block you want him to climb). 10 - Unlimited uzi ammo. 101-104 - Slides to the left while crouching when triggered (eg. train level - just doesn't work in trainmode). 1004 - Climbs up 4 clicks when triggered (seems the above OCB's may be combined with the multiple baddies setup). 1000 - N x 1000 - Is activated once the baddie with the previous thousand is dead and needs no trigger (have tested up to 20.000). Must be placed in room 2 of a level. Note: Baddies will pick up small medipaks in the same room they are triggered before going after Lara even if she shoots at them first. They can also jump 1 or 2 block gaps. 1 - Jumps to the right when triggered. 2 - Rolls to the left when triggered. 4 - Climbs up 4 clicks when triggered. 10 - Draws uzi when triggered. 11 - Jumps to the right when triggered and draws uzi. 12 - Rolls to the left when triggered and draws uzi. 13 - Crouches when triggered and draws uzi. 14 - Climbs up 4 clicks when triggered and draws uzi. 101-104 - Slides to the left while crouching when triggered. The setup requires the enemy jeep from Desert Railroad and an AI_X1 nullmesh with the same OCB as the jeep and the baddy. It works only in trainmode. When triggered, the baddy will ride the roof of the enemy jeep parallel to the railtracks, until they reach the AI_X1 nullmesh. The baddy will then jump off in the direction he's placed in the map, while the jeep will fall back. 1 - Lies down until triggered. 1000 - beetles come from the floor. 2000 - beetles from the ceiling. 4000 - beetles release slowly followed by a gush. You can have up to 128 beetles and these are also determined by the OCB number. For example, if you want 100 beetles to come from the floor slowly and then gush out, put (100 + 1000 + 4000) = 5100 in the OCB. To get rid of the beetles use a flipeffect 31. -60 Stands still with arms crossed over chest until triggered. 2 Lays on the ground until triggered and only gets up as Lara approaches. Note: Mummies will only go up or down 1 click floors. 1 - Jumps out of ground to right. 2 - Jumps out of ground to left. 3 - Lies visible on the ground until triggered. Note: You can use AI Guard with the skellie. 0 Rests on the floor until Lara gets close to it (about a block) or shoots at it. 1 Works with two AI_FOLLOW nullmeshes. One placed at the same block as the SPHINX and one where it is supposed to go first. When triggered, it will get on its hooves right away and move to the desired spot. - How to make baddies act in certain ways. AI_GUARD - Makes the baddy move his head about, looking left and right, with a 180 degree field of view. Drop an AI_MODIFY on the block as well, to make the baddy look straight ahead only. Baddies begin attacking once Lara shoots at them, or in some cases, when she comes into their view and gets within one block of them. AI_AMBUSH - Makes the baddy run to a designated square by dropping an ambush object on his square and another on the square where you want him to go. AI_PATROL1 & 2 - To make a baddy run a patrol between two points, drop an AI_PATROL1 object on his square, drop another AI_PATROL1 object somewhere else on the map, and finally an AI_PATROL2 in another location. The baddy will go from the (second) AI_PATROL1 to the AI_PATROL2 and back again. Conditions for chasing Lara are the same as the Guard behavior. AI_MODIFY - Drop an AI_MODIFY on the block with the AI_GUARD, to make the baddy look straight ahead. AI_FOLLOW - Baddies with this behavior are probably 'goodies'. To make a baddy wait for Lara to follow him to a specified point on the map, drop an AI_FOLLOW object on its block, and drop another AI_FOLLOW on the map where you want the baddy to go. Use this to get 'baddies' to show Lara a switch or a secret room. 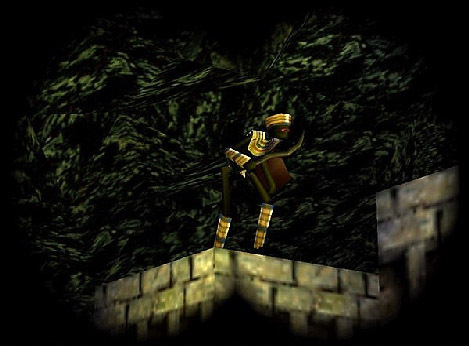 If Lara attacks the baddy, he will immediately forget about the follow behavior and attack her instead (except with the Guide in "Tomb of Seth", Lara can't kill him and he will not attack her). AI_X1 - AI_X2 - Drop one of these on the SAS Guard baddy square to make him fire grenades (if you drop an AI_X1 on a different Baddy, and he is triggered first, the AI_X2 baddy will not fire grenades). NOTE: If you put a HEAVY trigger under an AMBUSH or PATROL AI point, the baddy will trigger it when he gets there. Baddies can never pass over an illegal slope. Box zones (splitter boxes) are placed where you want to prevent baddies from going. These squares appear gray once assigned. Flying enemies cannot be stopped this way. They are extremely useful behind closed doors, as they prevent baddies trying to get through the closed door to get at Lara, which can look a bit strange. However, once doors open, baddies can pass over the grey box which makes for realistic gameplay. You can place a pick-up item (ammo, weapons, medi-packs) on the same square as a baddy, and the pick-up will be left on the same square where it dies. However, this method cannot be used with some enemies, so experiment may be needed.